St Mary’s Church - Absolute Tours Blog: Walking tours, Private & Specialty Tours and more! You’ll find the Church of Our Lady of the Assumption, or St Mary’s Church, standing proudly in the Northeast corner of the Main Square. It’s a beautiful sight to behold. And even better, the Gothic architecture houses an even more impressive interior. Without doubt it’s the largest and most important church after the Wawel Cathedral. 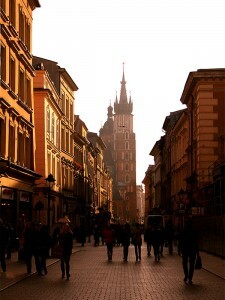 It’s beginnings were in 1221-1222 by the Bishop of Krakow, Iwon Odrowąży. A while later, the Mogols were responsible for partly demolishing the church during the Mongol invasion of Poland. Afterwards it was in need of rebuilding and this was done in Gothic style. The church was in the process of reconstruction throughout the periods between 1355 and 1365. This included a lengthened presbytery and tall stained-glass windows. In the 15th century, side chapels were an addition. And by raising the Northern tower, thus creating the town watchtower. 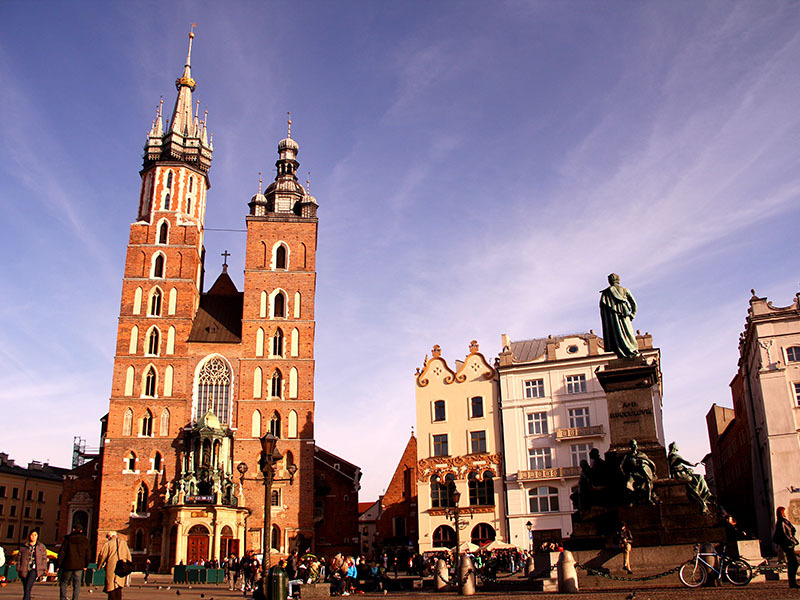 If you’ve not heard the legend of the two brothers in the Mariacki’s two towers of different heights, it’s a story you should ask your guide to tell. 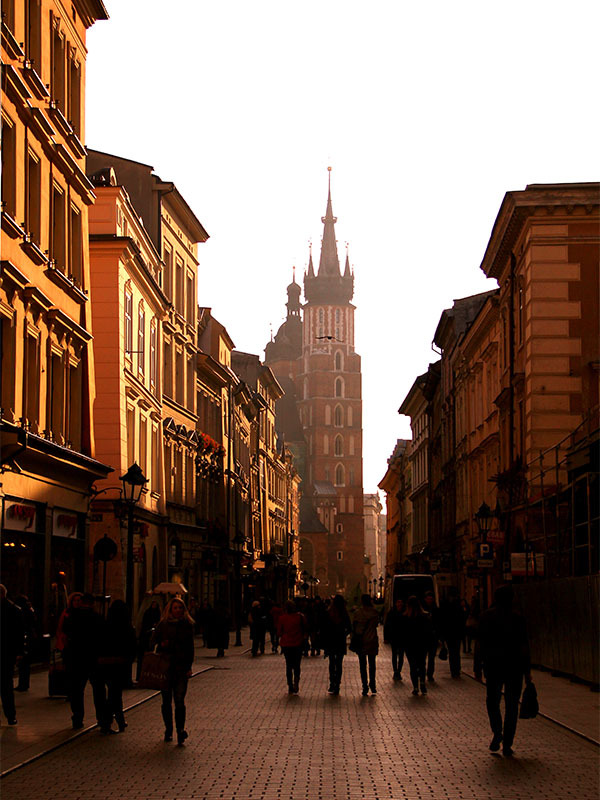 You can hear the Polish anthem playing four times every hour by a lonely bugler in the highest tower. The abrupt ending of the anthem references the unfortunate bugler. Sounding the alarm during the Mongol invasion, the poor chap managed to take a career ending bullet in the throat. Once inside, you’ll see one of Mariacki’s most magnificent pieces, the 15th century Gothic altar by the German sculptor Veit Stoss. It’s an exquisite wooden masterpiece, with the altar features intricate carvings of religious figures. During the second World War, the Poles dismantled it. This was an attempt at preserving it. Unfortunately the German’s discovered the altar and sent it to Nuremberg. 1946 saw the alter retuning to Poland, with the church restoring it to the original location. In the 18th century the interior of the Basilica was renovated into Baroque style. In order to create Mariacki Square the adjacent cemetery needed knocking down. It wasn’t until the 19th century that the decor was returned to its Gothic glory. Inside Mariacki you’ll find that there are multiple chapels. Amongst them is the St-Anthony Chapel or Criminal’s Chapel, where prisoners awaiting execution spent their last night. Also, the original organ and works of various sculptors and artists adorn every corner of the interior. When you stand there it’s easy to lose yourself in contemplation.